©2009 Eve Ortega (P)2012 Audible, Inc. I don't know if I can adequately review this audio book, since the narration and production were so bad. I guess the characters were interesting, and there were actually a couple of humorous moments. There was character growth as well. However, there were several places in the narrative where the story could have been wrapped up, but it just kept going on with almost willful misunderstanding and angst. I guess I'll have to read it in print. If only they had gotten someone like Roslyn Landor to do the reading! 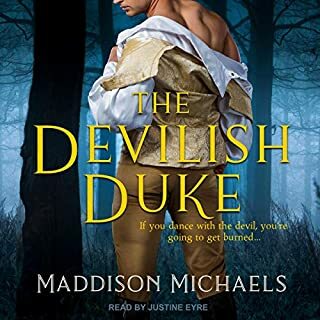 It was so distracting it was difficult to truly follow the story line - maybe this book is better than my experience, since I listened to and enjoyed the other Tessa Dare novel available at this site at this time. I likely will NOT give this a repeat listen. I have listened to over 300 books... this one was the first that I made myself keep listening because of poor reading. She can't even read a full sentence with out some weird pause... don't think she is a native english speaker... or maybe she is just a poor reader. Anyway I hope Tessa Dare never uses Helen Moore Gillon again, because she pretty much ruined a good story! This is a promising author... her other book One dance with a Duke was great! So don't let this narrator turn you away from her other book. Reviews were right, narration was terrible! The story was okay, although I don't think I could fairly judge it given that the horrible narration was so distracting. It was slow, and painful, and at several points I really thought I'd just give up on it. I think the romance was very entertaining for most parts, but the narrator was so bad that I couldn't finish listening! So will have to do without the ending unless by some chance that it will be recorded with a more skilled narrator. The narrator was very droll, slow, pronounced every word as if she was dictating. Her male male voices were very nasal, and made every male sound the same and as an old snobbish aunt!! The reader. 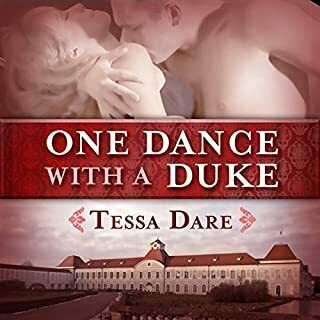 Poor Tessa Dare wrote a lively, witty and very entertaining romance, which the reader has utterly ruined in her prissy, ponderous, overly slow, oddly articulated reading. It's as if she were reading it for the simple minded or English-as-second-language students. Both hero and heroine. He's a rake and friend of the heroine's older brother, she's in love with another of her brother's friends and trying to practice her 'wiles' on the rake. See above. If this isn't her first job, let it please be her last. Read the book, avoid this audiobook, it will detract from your enjoyment of the author's ready and very sly wit. Such a delightful story deserves an equally deft, and droll performance. This is a do-over for me. I regret I cannot get a refund, I'm that annoyed. What disappointed you about Goddess of the Hunt? I read the book a few years ago and liked it--Tessa Dare is always good. But I could not get through more than 20 minutes of this narrator's absolute massacre of this title. Sad waste of a credit. She has this odd galloping narration that drags out every 4th word--no kidding. Makes the sentences nonsensical. You have to really concentrate to get beyond the pacing to understand what's being said. Who would you have cast as narrator instead of Helen Moore-Gillon? Almost anyone. I really like Angela Dawe, Ashford McNab, Rosalind Landor, Susan Deurdan, Rebecca deLoew. What character would you cut from Goddess of the Hunt? No one--story is fine as I recall from reading it.. Couldn't listen to it. Would you consider the audio edition of Goddess of the Hunt to be better than the print version? Not a fair question for me as I totally love to be read to regardless... I LOVE AUDIO - I JUST WANT THE REST OF TESSA DARES ON AUDIO.....PLEASE.... her books really hold my interest... laugh, cry, enjoy! Her audios on her website are so funny/cute originally TD creations! THE BEGINNING WAS REALLY FUN... ANTICIPATION THROUGH OUT! LOOKING forward to next two books ... AS SOON AS THEY ARE AVAILABLE ON AUDIO! What aspect of Helen Moore-Gillon’s performance would you have changed? She was a little drawl/tone ... sorry, but I love an accent in my narrators so at least I enjoyed that part! BRING MORE TESSA DARE BOOKS IN AUDIO PLEASE... HER STUD SERIES TOO! 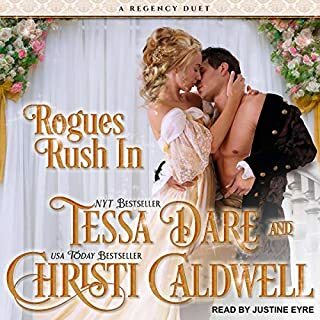 I was happy when I found another Tessa Dare novel available to me at Audible. I didn't notice that it was narrated by a different reader than the previous book I had enjoyed so much. That usually isn't a big deal. Just takes some getting used to, but I've always been able to overcome that situation. But not this time. It wasn't even that the reader has an annoying voice or that it grated on one's nerves. She has a nice soft voice and a wonderful accent. I think if she had just read the darn book, I could have born it, but that was not to be. Her acting skills are atrocious. I didn't realize you even needed acting skills to be a professional reader. But it's certainly plain when those skills are lacking. Is it possible that there are no standards when it comes to reading audiobooks? I can't even tell you whether the story is any good at all because I just obsessed on THAT VOICE. I stopped listening an hour in. I've never done that before. I'll wait until the experience has faded from my memory and try to read the Kindle version of the book. Bottom line? Don't make my mistake. I guarantee if I had listened to the audio sample before I rushed to purchase, I would have certainly not done so. 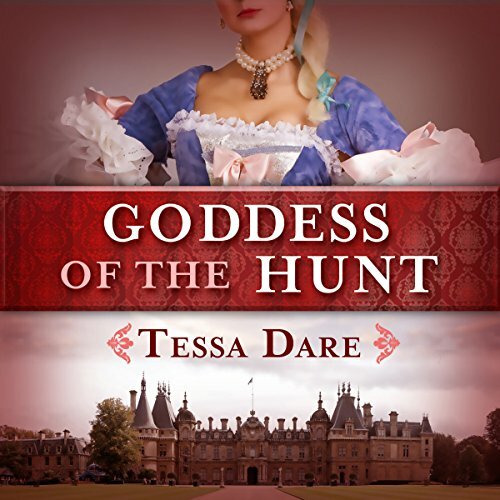 One of those times where I wish I'd paid attention to other reviewers; Helen Moore-Gillon's stilted narration ruined the story for me, which is a shame because I had enjoyed Tessa Dares other book currently available here. Next time I see Helen Moore-Gillon as a narrator of something I want to have, I'm just going to buy the book and avoid the audio version. Overall not a bad book, good storyline to it but Nearly gave up because of narrator. Enjoyable story but horrible male voices! It really does ruin a romance when the hero of the piece sounds like a moron most of the time...It just takes the pleasure out of listening to the story. Very frustrating!